Geometry Tutorial Programs, Videos and Apps | Math Tutor Inc.
interactive learning and review program for geometry. Parents seeking homeschool geometry self-study learning software will find the program to be perfectly suited to their needs. 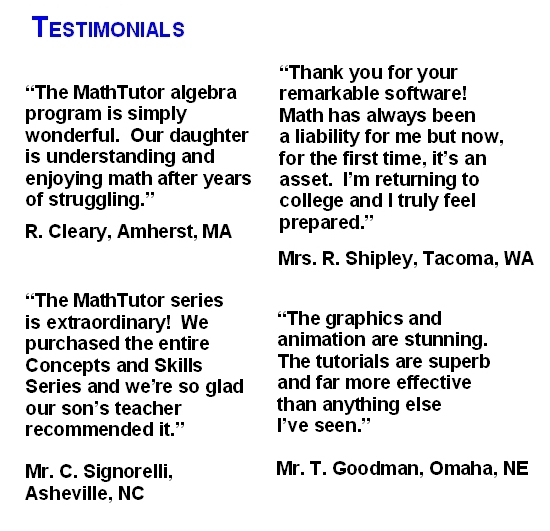 And individuals who simply want an interactive high school geometry tutorial or refresher program that will help them learn at their own pace will find the program to be an ideal resource. GEOMETRY is a dynamic, interactive program that engages students as they learn the concepts of geometry and problem solving. It can be used for self-study and to supplement classroom instruction in high school and middle school math classes. The program also features diagnostic and assessment tests that measure student skills and provide a customized study plan for each student. Designed by math educators and research based, the program provides interactive geometry lessons suitable for students at all levels of ability. The program is also effective when used as software for remedial or developmental math instruction. Examples and geometry problem solving exercises progress gradually from the simpler to the more challenging, allowing students to build their skills and confidence.